The biomechanics of the body make the neck highly susceptible to a number of problems, and many people suffer from mild to severe neck pain. An average head weighs close to 12 lbs, which is the cause of significant force and stress on the cervical spine. 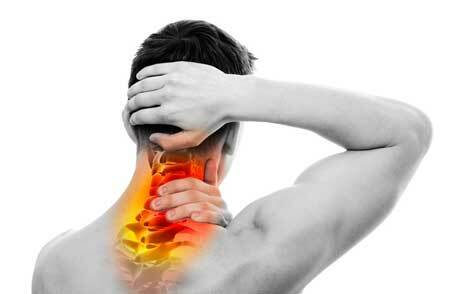 Ostir Physical Medicine offers both medical pain management and non-invasive treatments to alleviate neck pain. Our doctors first assess a patient’s neck pain to determine if symptoms are due to a recent injury such as a sprain/strain or disc herniation, degenerative changes and or poor posture. A physical examination and non-invasive diagnostic tests allow our doctors to pinpoint the exact cause(s) of the patient’s neck pan and can then determine the best possible treatment. Medical pain management and natural pain relief recommendations along with consistent physical rehabilitation and chiropractic care provide a well-rounded approach to treatment of neck pain. Each year, millions of Americans suffer from chronic headaches. Headaches can be divided into four mains categories: tension, cervicogenic, migraine and cluster. Tension headaches are the most common and are described as mild to moderate constant band-like pain, tightness or pressure around the forehead/back of head. Cervicogenic headaches are less common and can be caused by a variety of neck conditions, creating referred pain. Migraine headaches are chronic and create throbbing head pain that can last for hours or even days. Symptoms can be so severe that light or sound can exacerbate the condition. Cluster headaches are high intensity, unilateral headaches. The duration of the common attack ranges from 15 minutes to several hours. These headaches have a rapid onset and most often do not contain the preliminary signs characteristic of a migraine. Trigger Point Injections (TPI): Trigger points are discrete, focal, hyperirritable spots located in a taut band of skeletal muscle. They produce pain locally, in referred pattern and often accompany several musculoskeletal disorders including chronic neck pain. TPI have been shown to be one of the most effective treatment modalities to inactivate trigger points and provide prompt relief of symptoms. TPI therapy in our clinic contains Sarapin, a natural anti-inflammatory substance that is safe, effective and without the unwanted side effects or cortisone. Cervical Traction Therapy: Timed intervals of distraction and alternating tensions allows for unloading or decompression of the intervertebral discs. Through distraction and improved positioning of the spine, the desired effects can be achieved in treating many cervical conditions including disc herniation, degenerative disc disease, posterior facet problems and nerve root impingements. Pneumex Postural Corrections: The Pneu-Back program is an advanced treatment system based on extensive research of postural and muscular imbalances. The program itself is an aggressive, documentable approach to proactive and reactive treatments of several spinal disorders. The emphasis is on posture, flexibility and functional strength; to stabilize and correct such disorders and imbalances. A system of postural corrective exercises, unweighted gait training and spinal traction therapy are recommended as necessary and can restore muscular imbalances and improve mechanical stress loads through the upper back and neck.